While Kimchi (fermented cabbage) made its appearance on the food scene quite some time back and is relished eagerly with appetizers and main course, there seem to be very few other Korean dishes that seem to have made a mark and makes me wonder why? No clear answers here but Korean cuisine is varied, fascinating and deeply influenced by culture, climate, geography (peninsula) and proximity to China and Japan. Special importance is given to presentation and harmony. 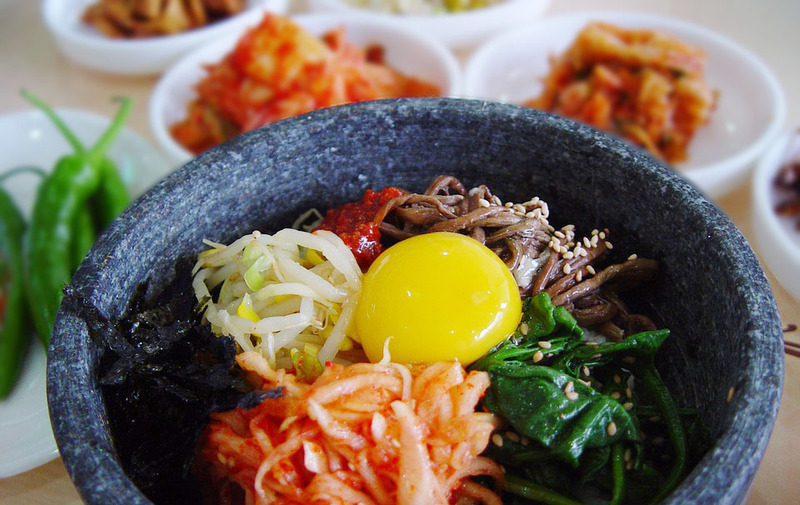 The staple food in Korean cuisine mainly contains rice, noodles, vegetable, fish and tofu. In comparison to Japanese and Chinese food, Korean food is more heavily seasoned, savory with bold flavors which is the primary reason I feel it will be popular amongst Indians considering our palette. 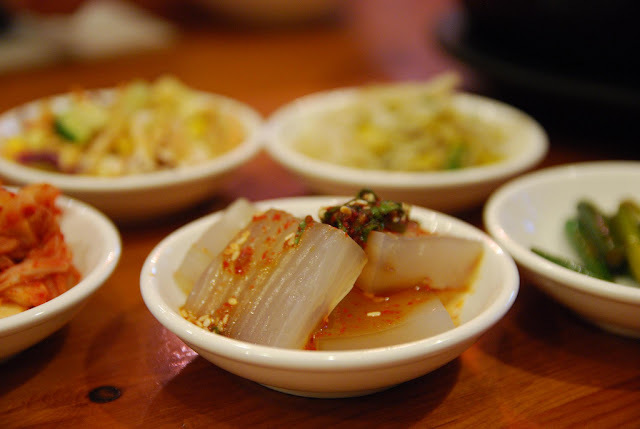 Preserving food is an age old tradition in Korea and a lot of sides dishes are pickled, salted or fermented. Commonly used ingredients include garlic, ginger, green onions, sesame, soy sauce, soybean paste, and chilli peppers (introduced by the Portuguese in the 17th Century). Did you know that Korea is actually the largest consumer of garlic? Korean Cuisine is distinct from most cuisines with the many side dishes (called banchan) served during meals which can range anywhere from 2 to 12. The side dishes can be vegetable, seafood and meat fares prepared in different styles and unlike western cuisines there are no separate courses and everything is served at the same time. The table arrangement can vary depending on the main dish served. The dining table setting (bap-sang) features rice as the main dish and the banchan arranged according to the recipes, color, temperature of the food with importance given to the balance and presentation. There are 3,5,7,9 and 12 dish table settings according to the number of side dishes. Other table settings are porridge table setting (juk-sang), noodle table setting (myeon-sang), liquor table setting (juan-sang), refreshment table setting (dagwa-sang) and large dining table setting (gyoja-sang). All meals are normally eaten with a set of wooden, silver or stainless steel chopsticks and a rather long handled but shallow spoon. A traditional meal is served on a low table with diners sitting on cushions on the floor. Korean culture is very similar to Indian culture and is based on family, respect, and responsibility. This design is applied to table manners as well where elders are served first and no one begins until the eldest person begins. - Don't pick up chopsticks or spoon before the eldest person. - Don't stab foods with chopsticks. - Don't eat with fingers unless you are having finger food. - The spoon and chopsticks should not be held together in one hand. - Use the spoon only for rice and soup. - Take food within reach and do not stretch your arms out too far. - Use both hands when offering a dish or drink to another diner. 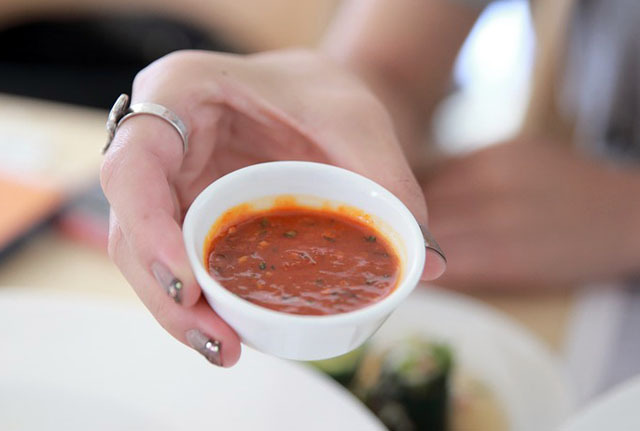 - Don't stir common or shared dishes with your spoon/chopsticks. - Do wait for the Eldest person to finish or dismiss you before leaving the table. 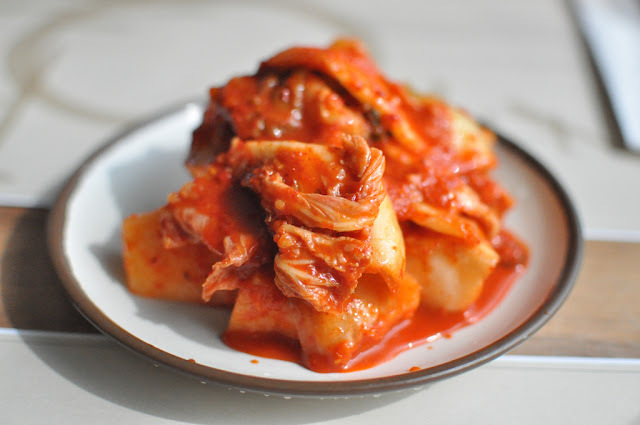 Kimchi is a spicy and sour dish of fermented vegetable, the most popular one being cabbage. No Korean meal is complete without kimchi and is available in more than 100 variations. The origin of Kimchi goes back to 7th century Korea and it is heartening to know that the kimchi we eat today is still prepared the same way since its inception. Kimchi has high nutritional value, fiber content and low calorie and also featured in 'Health' as one of the top five healthiest foods in the world. 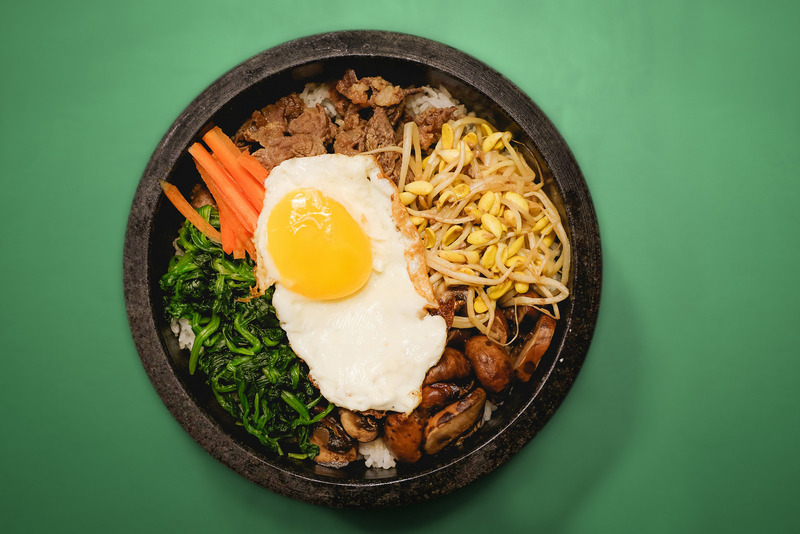 Bibimbap which literally means "mixed rice" is served as a bowl of warm white rice topped with namul (seasoned and sautéed vegetables) and gochujang (chili pepper paste), soy sauce, or fermented soybean paste (doenjang). A raw or fried egg and sliced meat are common additions. The hot dish is stirred together thoroughly just before eating. 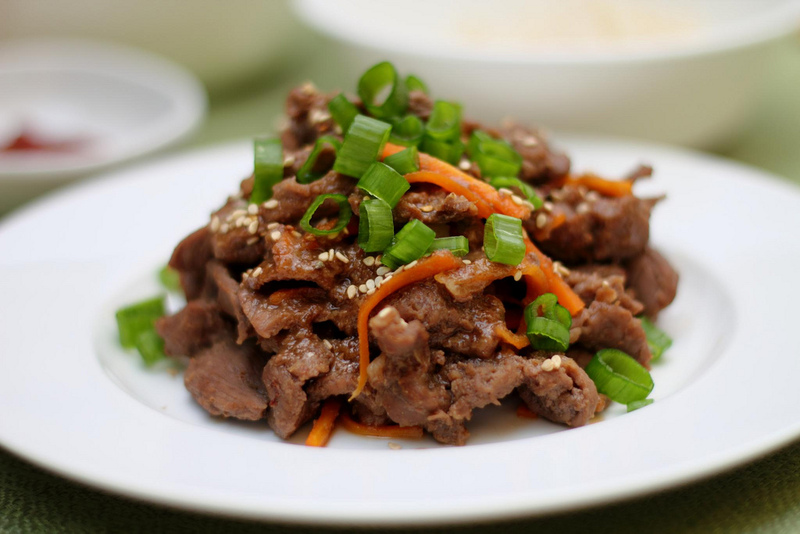 Bulgogi which literally means fire meat in Korean usually consists of grilled marinated red meat and is a very popular Korean meat dish throughout the world. To add flavor whole cloves of garlic, sliced onions and chopped green peppers are often grilled or fried with the meat and traditionally eaten with lettuce wrapped around the meat and a dab of ssamjang (thick and red spicy paste made of made of doenjang, gochujang, sesame oil, onion, garlic, green onions, and optionally brown sugar). 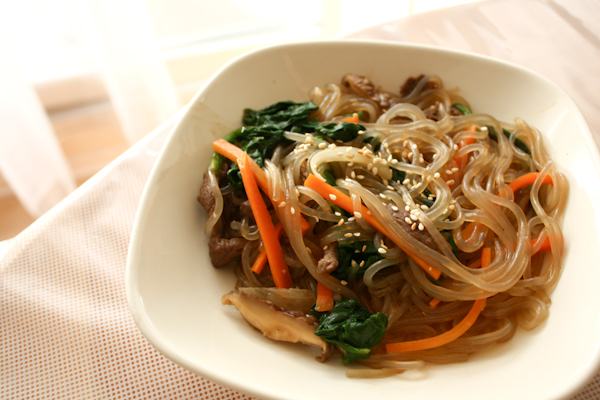 Japchae is a traditional flavorful Korean noodle dish commonly served as a side dish though it may also be a main dish. It is made of sweet potato noodles (dangmyeon) stir fried in sesame oil with shredded vegetables. The dish is usually garnished with sesame seeds and slivers of chili and may be served hot or cold. 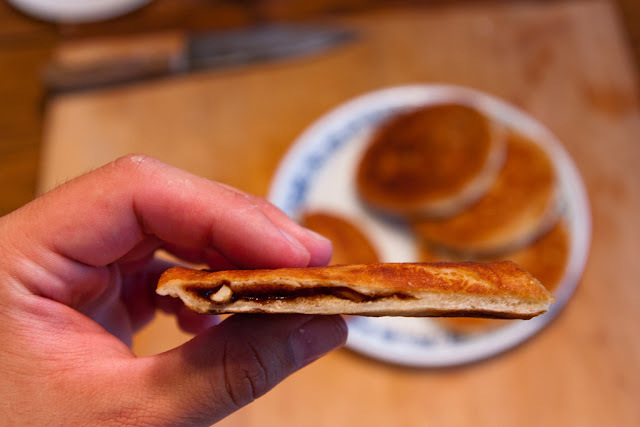 with a sweet mixture containing brown sugar, honey, chopped peanuts, and cinnamon which is then cooked on a griddle and pressed flat into a large flat circular shape. The eating experience is a crunchy exterior and a soft interior with sweet irresistible flavors. Well here was a very brief introduction to Korean cuisine and hope this read made all you folks eager to explore a cuisine that I believe will explode on the food scene in India in due course. Where do you recommend Korean cuisine in Mumbai?Apart from Heng Bok..
wickedspoonconfessions recommends Joss from personal experience but it is not a Korean Specialty restaurant but does serve Korean Food as part of its menu. I went to some Korean cuisine before but it seems that their food cold not be so satisfying and I got some troubles with cooking on some foods of Korean cuisine products. So, while writing with Essayontime reviews about food preparation, I do a lot of things to improve my cooking styles.